Copper Phosphorus or Phos-Copper is used in non-ferrous goods manufacturing industry for introducing phosphorus in the alloy compositions. 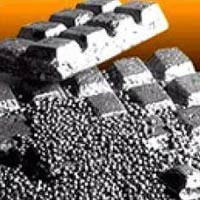 The introduction of phosphorus deoxidises and refine the alloys. The phos-copper is a homogenized alloy, which is manufactured using pure materials in compliance with international standards ensuring consistent pick-up of phosphorus material. Brazing Alloys, Welding Electrodes, Phosphor Bronze, Refining of Hypereutectic Aluminum Silicon Alloys, Deoxidized Copper and Copper Alloys.